Chess Game Benefits: Why play chess? Are you a chess player? I know you'll agree how chess gave benefits to a player like me and you. CHESS - is a board game in a two chess player aiming for a checkmate on opponent's king. For any Pinoy will think at best in chess. A simple definition I had given about chess, because chess is everything. Why I made this blog about chess is that I want to inspire our fellow Filipino - Pinoy people to play chess seriously with fun and learning process. I would impart what chess can do to our fellow pinoy and to our children for their study curriculum. What's the benefits of chess? Why play chess? These are the questions we're going to talk about. In a survey and based on factual idea, chess can be played between young and old, old and young, young and young, old and old, or any ages and professional level as long as he can play. Chess does not discriminate races, position, degree, and to us pinoy. It can be played through internet online, or through basic equipments - the 64 squares board and the 36 chess pieces (kings,queens,bishops,knights,rooks, and pawns) black and white. Chess gathers multiple of your friends by way of fun and teaching them. Chess is everything for us pinoy. Chess benefits in all areas - education, technology, science, phsycology, and in any other aspects of study. In other country like Russia, Ukraine, Poland, etc, children from these countries have opportunity to study chess, they have chess as their basic subject of study - curriculum. Because chess helps the child to develop his/her mind by memorization, analytical, logical, abstract reasoning, psychological, mental concentration, right decision, and even improve child's IQ (Intelligent Quotient). And how about to our pinoy children? Only few of them knows the basic of chess, an average age in our Philippines that fellow Filipino person plays chess is about 12 - 16 years old. Few knows to play chess at the age of 5 to 11 and all others from 16 - up. And some may not even know how to play chess, what they only know is naming the chess pieces which was the knight is to be named as horse. Forgive me for pointing out that things. 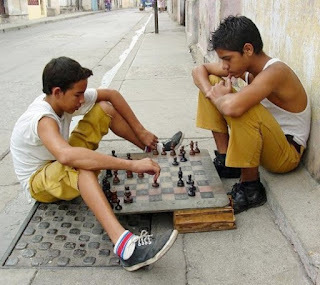 Chess benefits everything in our mind, just look at the picture how chess improves in any areas. Because of these, we have some Pinoy great chess grandmasters, international masters, and national masters, and unrecognized pinoy chess genius. These titles are recognized as international title by FIDE. They are GM Wesley SO (Top Pinoy GM), GM Antonio Rogelio (2nd Top Pinoy GM), GM Eugenio Torre ( Asia's first grandmaster), and many more Pinoy chessmasters, they were not fighting only for themselves but fighting for the Philippine country that made us pinoy pride just recently got second spot on ASEAN chess game next to CHINA.Till now, they improve a lot better, keep on searching something new, something unique, something a very solid moves, in opening, middle game, and end games - they are the pinoy chess genius; that made us to be proud for what they have achieve right now in chess. And it's not impossible to raise a number of pinoy chess grandmasters in our country Philippines if we unite and helping each other as a pinoy chess players of the incoming generation. MABUHAY to Pinoy great chess players! More support to our Pinoy Chess Athletes! More Power to Chess World and till next time!